Bhel puri is a light refreshing Indian snack food that comes together in minutes. Loaded with crispy puffed rice, tomatoes, onions and boiled potatoes seasoned with a few different chutneys, it's a delicious savory snack on a hot muggy day. When it’s hot and muggy outside and your appetite has withered away in the sweltering summer heat, Bhel Puri is just the kind of dish you need to awaken your taste buds with an explosion of colors, textures and flavours. This is my post for June’s Dinner and a Movie event. The June movie, Monsoon Wedding is chock full of scenes of the hectic New Delhi street scape, depicting the ubiquitous food scene. It only seemed natural to do a post on chaat, Indian street food. I know bhel puri is more typical of Mumbai street food, but I hope you guys can forgive this transgression as bhel puri is one of my favourite snacks… ever, and I just couldn’t resist the opportunity to post about it. 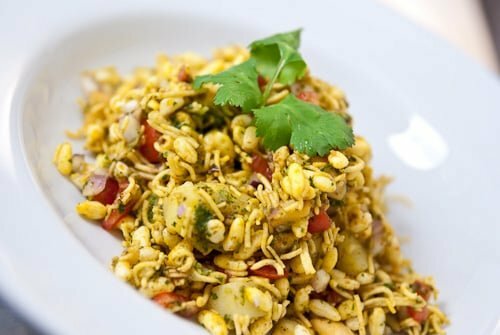 Bhel Puri is a mixture of puffed rice (think giant Rice Krispies), sev (fried chickpea noodles), tossed with chilies, vegetables and some sweet and tart chutney’s. The textures of the crackly rice, crunchy noodles, and crisp veggies meld perfectly with the salty, sweet, sour, and spicy seasonings that coat each morsel. The mere smell of the cilantro, cumin and lime is enough to make me salivate like a Bullmastiff, but when you lay eyes on the confetti of colors on a plate before you, it’s hard to resist the primal urge to pick up the plate and inhale its contents. I’ve never tried it, but if you don’t have an Indian market near you, you could probably get away with using rice cripsies for the puffed rice and crumbled instant ramen in place of the sev. Once it’s mixed, it needs to be eaten right away for the same reason that you don’t want to let cereal steep in a bowl of milk. This makes enough for 4-6 appetizer sized portions, but 2 of us managed to devour the whole batch in a few minutes, so it does just fine as a meal too. Toss the potatoes, tomatoes, red onion, chile, tumeric, green chutney and tamarind chutney together. Add the puffed rice and sev and toss to coat. Add some salt if needed. Serve immediately. mmm. this sounds like it would be good for a muggy day! I like how the noodle is the protein and the starch is just mixed in. It’s the opposite concept from most meals. It looks great! I’ve never had Bhel Puri before. I’ll have to check it out. very interesting.never heard of this. i actually thought there were sprouts in there and then i looked at the recipe. the puffed rice must bring a great crunch to this. too bad it hasn’t really been sweltering at all! i want sweltering, damnit! I’ve seen this at my favorite Indian restaurant, but never knew what it was called until now. The restaurant has a station like a salad bar where all the ingredients are laid out allowing everyone to customize his own bhel puri. Fun. jesus, this looks good. i think it’s great because it is a departure for your usual delectable fare. i want some. Is green chutney the cilantro mint one? Looks and sounds great! I have to admit I had never heard of it before. I’m off to my Indian supermarket now, depending on what they have in store, this may well be Wednesday’s Vegetarian meal, muggy weather or not! I love bhel puri, it is ages ago i had them. This is something we used to eat in out teenage years fromp the street vendours etc…..looks so so delicous. This sounds delicious. I want this for lunch today! real deal bhel puri is so so good, but i have to say i’m really intrigued by the suggestion of trying ramen noodles instead. i think that would taste kinda good actually. oh i like this. looks like something i could just slowly munch on throughout the day…strangely the summer heat never makes me lose my appetite. in fact it makes me crave naughty things like crisps and onion rings! Good recipe! Bhel has one more very important ingredient. “Chat Masala” – It is mixed with Bhel or sprinkled over in very small quantity. You can easily find it any indian grocery shop or Amazon. Also, raw mango enhances taste of Mumbai bhel. Yep, I actually made my own green chutney (cilantro only), and will post the recipe soon. We make Bhel puri in a little different way. I do make a mix of chopped red onions, tomato, cucumber, and potato (although I am thinking of changing potato to mango during the summer). Then I toss with the bhel mix, and make a “bulls-eye” on top of the individual bowls before servig. The bullseye consists of a dollop of plain yogurt, topped with a smaller dollop of tamarind/date chutney, followed by a smaller dollop of mint chutney. Each person quickly mixes and eats while still crunchy. The yogurt adds a healthy and refreshing twist to it. It is new to me. Looks healthy yet delicious! I work with a lot of Indians, and they make big batches of this for afternoon snacks all the time. I never knew what it was called, though. I like the puffed rice and the spiciness, but the raw red onion flavor is a little too strong for me. ah, the food of my people! bhel puri is magical, I agree, and it’s totally a go-to lazy dinner in my house because I can keep sev, etc. on hand & potatoes are always in the pantry. I make my own cilantro & tamarind (imli) chutneys as well–they freeze beautifully. the combinations in bhel puri vary depending on who you ask, but my mom likes hers with roasted peanuts & I like mine with sprouted mung beans. I love bhel puri- we usually eat it as a kind of party food at home as it is a roadside snack in India. Great recipe! One of more popular Indian restaurants in Atlanta, Bombay Cafe, serves this dish and it’s all I get when I go because it is so incredible. The blend of flavors is just out of this world. I haven’t tried your recipe yet but visually it looks just like the one I get so I can’t wait to try it. this looks delicious! i went to the idian supermarket and discovered that there are ready made packets of the bhel with all the spices…….ustill hve to add the veggies and sauces though. Addition of raw mango (finely chopped) enhances the flavor by leaps and bounds. Bhel Puri is one of my favorite Indian Street Foods!